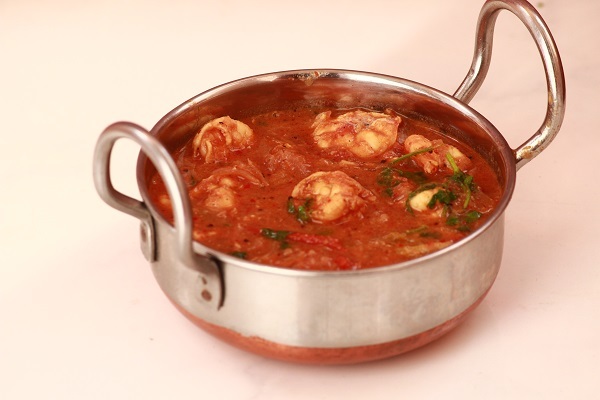 Chettinad prawns curry is a tasty prawns dish from Chettinad. Chettinad is a place in Tamilnadu, very famous for its aromatic and spicy cooking. 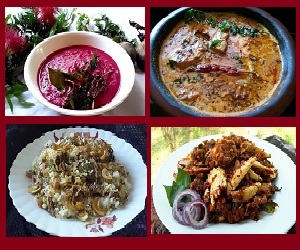 Chettinad is very famous for its non-vegetarian dishes. This prawns curry can be served along with rice. Like all other chettinad dishes, this prawns curry is very aromatic and is easy to make too. The freshly made spice powder gives the dish its aroma. The leftover spice powder can be used the next time you make curry. But I used it while making soya chunks masala and that was very flavorful. 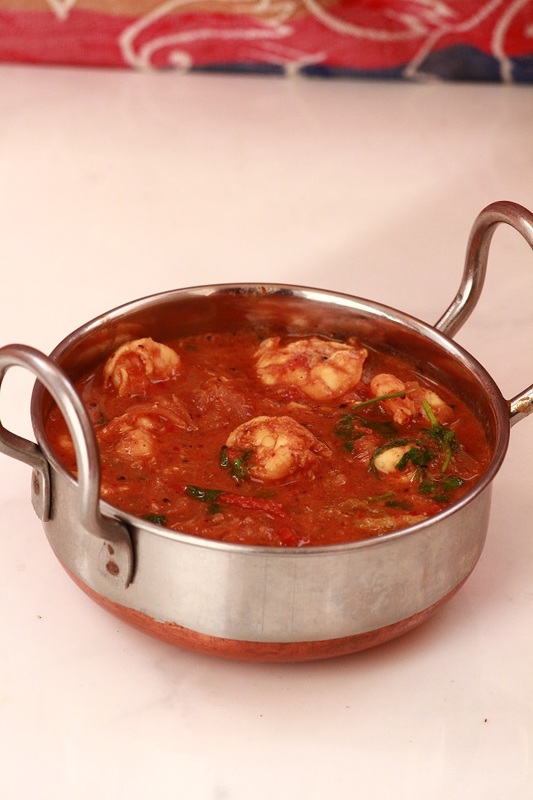 This prawns curry is very spicy, aromatic and flavorful and tastes great with steamed rice. At home, everyone loves chettinadu delicacies and this prawns curry was a hit among family members. 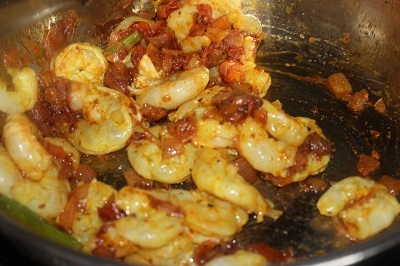 My kids love prawns and I make them very often. I have already shared prawns roast, prawns biryani recipe here. This is another addition to the prawns recipes. This is a prawns curry with no coconut in it. 1. Devein the prawns, clean it and wash it in clear water 5 – 6 times. Squeeze out the excess water, add turmeric powder, salt, mix well. Cover and keep it aside for 10 – 15 minutes. After 15 minutes, wash it once more under clear water and keep aside. 2. In a pan, add all the ingredients given under the heading ” for roasting and grinding” and roast in low flame until it starts leaving a nice aroma. Turn off the flame and allow it to cool. Once the roasted ingredients get cooled, grind it to a fine powder. Keep aside. 3. Heat 1 cup of water in a pan. When water is hot enough, add tamarind and leave it aside for 10 – 15 minutes. Extract the tamarind juice and keep it aside. Discard the pulp. 4. In a pan, heat oil. When the oil is hot enough, splutter mustard seeds. 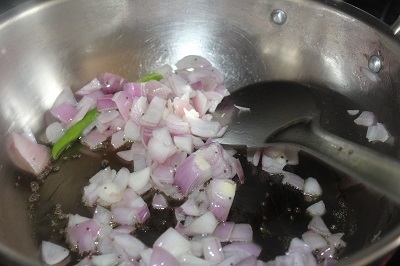 Add finely chopped onion, curry leaves, hing, green chili, ginger garlic paste and saute till onion turns translucent. 5. Add chili powder, turmeric powder, coriander powder and saute well till the raw smell of masala goes off. 6. 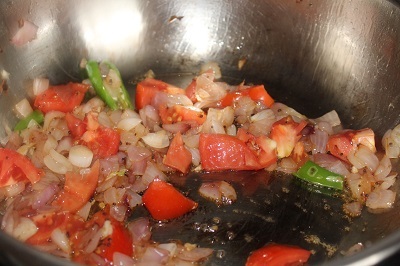 Add finely chopped tomato and saute again till the tomatoes become mushy and oil starts separating on the sides of the pan. 7. Now add the cleaned and marinated prawns, add required amount of salt, and mix well. 8. Add tamarind extract, 1/2 cup of water, salt and bring it to a boil. Then reduce the flame and cook for 2 – 3 minutes. 9. 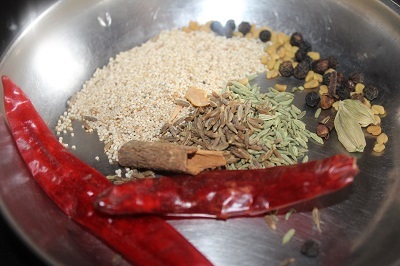 Add 1 tablespoon of ground masala, mix well. Cook again on low flame for another 5 – 6 minutes. 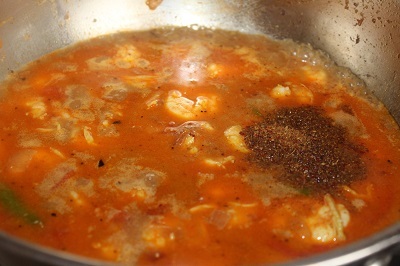 By this time, the gravy will become thick and oil will start floating on the top. 10. Finally, garnish with coriander leaves and then turn off the flame. 12. Chettinad prawns curry is ready. Serve prawns curry with rice. Next Post: Dahi Bhalle Recipe/Dahi Vada Recipe.